A.) It is a Fantasy Mecha (Giant Robot) RPG where you will pilot some of the most devastating machinery in the entire universe. It is free and 100% playable in your web browser with nothing to download or install... just like our other games... but with...um... giant robots! 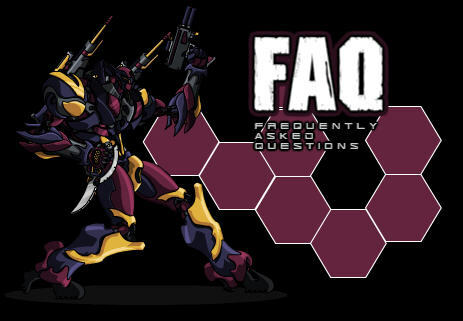 In fact, you can tell people that it is blatantly AQ+DF with giant mecha! Q.) What is a Fantasy Mecha game? I mean, how do you mix fantasy and sci-fi? A.) That is such a good question that you should probably help us answer it! Q.) How tall will the mecha be? Q.) When does MechQuest take place in the timeline of AQ/DF? Answer 1.) No body is really sure.... it is a mystery. Answer 2.) 5,000 years BEFORE the town of Battleon was built. Answer 3.) 5,000 years AFTER the town of Battleon was built. Q.) Are the rumors about the spell-cannon true? A.) .... how did you find out about that? Q.) If the power source for all mecha are reactors based on crystallized Dragonfire... what happened to all of the Dragons? A.) You will learn more about what happened to the Dragons at the University. Although some people believe Dragons still exist ... and those who do, well, every day they look towards the stars and wonder what they are doing. Q.) Can I use l337 on the forums? A.) No, your access clearance is not high enough to use leet. Q.) How is the game going to play? A.) Like a cherry bomb in a mailbox full of squid flavored candy next to a wooden munitions storage shed. Q.) Will there be any familiar faces in the game? A.) You bet! The only question is.... will they be those character's great great great great great great great great great great great great great great grandparents or grandchildren!? Q.) Why are you making a mecha game again? A.) <Smiles warmly and looks kindly upon you> I love fantasy games with swords and sorcery. But every now and then you just need something different to enjoy. I believe we are taking it one step further... we are actually going to merge swords, sorcery and mecha. Sorta like if you mixed a cauldron full of Star wars + Robotech + Harry Potter + Escaflowne + Voltron + Gundam + Evil Dead II. Q.) Evil Dead!? How are you going to put undead in a mecha game!? Artix you have gone too far! A.) Zombie Computers. Instead of brains they want CPUs! "CPU....... CPU....... CPU......."
Q.) Is this going to be another horrible Artix Entertainment train wreck that we cannot help but to watch? A.) You bet. Battle on!